Alain Miam Miam is a favourite of mine. 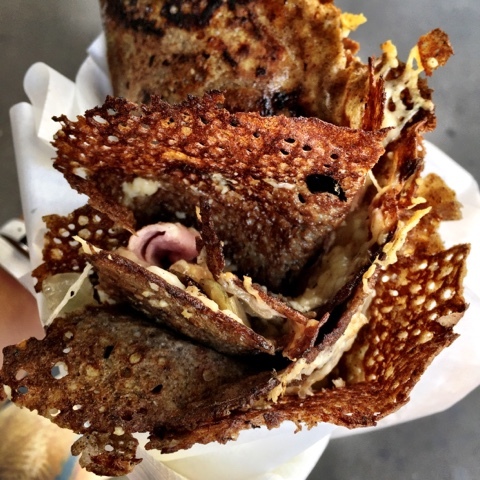 Nestled in the Marché des Enfants Rouges (the oldest under cover market in Paris that used to be a 16th century orphanage), you won't miss Alaim Miam Miam's galette/crêpe stand. It's the one with more than often a long line of hungry customers winding around the corner. 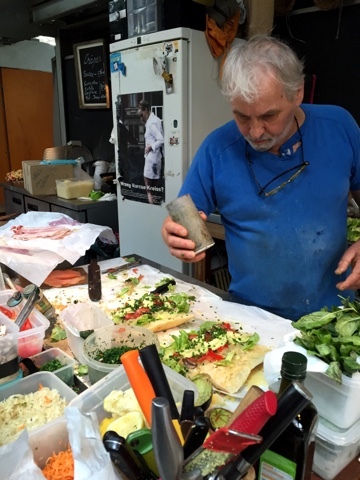 Here Alain handles every galette, crêpe or panini order personally, by hand, pausing to chat with you or to casually slice off a thin wedge of cheese to taste so you can make your choice. The servings are huge. you might even be able to share. 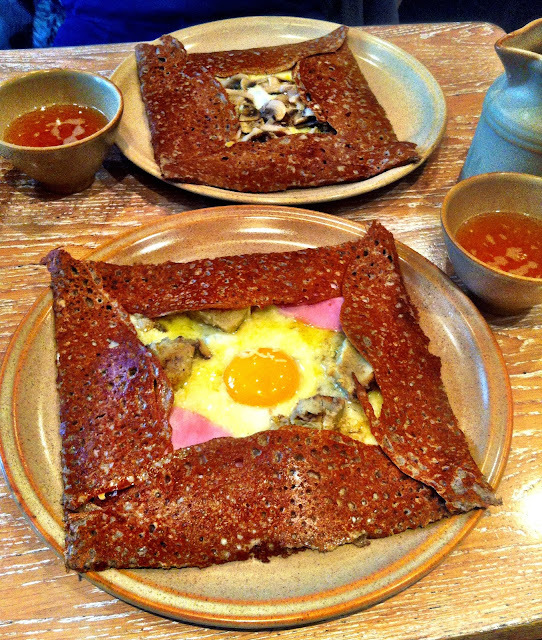 A MASSIVE galette like this (buckwheat crêpe with savoury fillings served in both hot and cold versions) will cost you between 7.50€ and 8.50€. This is the hot one with caramelised onion, gooey stretchy cheese, delicious ham and that crunchy Alain Miam Miam galette exterior. Still on the same theme, this is a place where you can order a crêpe for under 10€ easy and sit down. There are options to splurge (scallops anyone?) or to go for the basics. 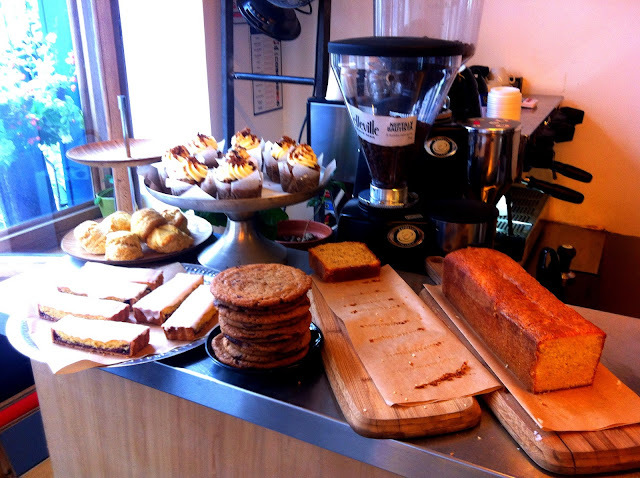 While it's a light meal, rest assured that good quality ingredients are always used at Breizh. 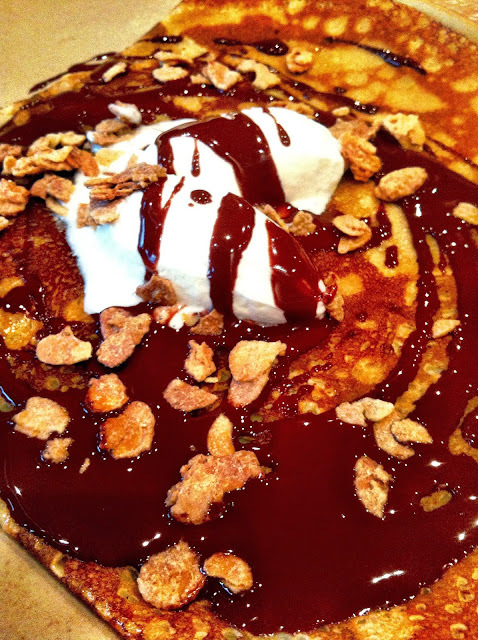 There is also a whole range of dessert crêpes as well! If you're on a budget with a friend, order a savoury and a sweet to share! If you aren't, order both each, plus some traditional cider to wash it all down. There will be times when you honestly can't be bothered hiking out to this "must eat" restaurant. It'll be raining, you'll be cold, you'll be lost. Or you'll be hot, you'll be tired, you'll be annoyed and it'll all just be too much of an effort. I've been there many times and consequently landed with an unexpected and un-budgeted bill for some really average food. The trick first of all is to try and resist the urge to sit down anywhere. Scan if there's a menu outside before sitting down. I know, it's hard when you are completely exhausted but it might save you having to order an 8€ cappuccino when faced with which overpriced item is going to rip you off the least. That 8€ would be much better spent on one of the best hot chocolates in Paris rather than a (most probably bad) cappuccino! 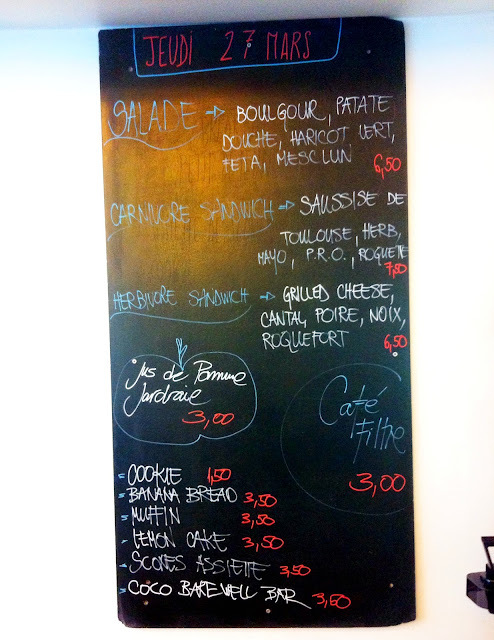 Look for a Croque Monsieur or a Croque Madame on the menu. It's basically a ham cheese toastie-toastie with béchamel sauce and extra cheese on the top. 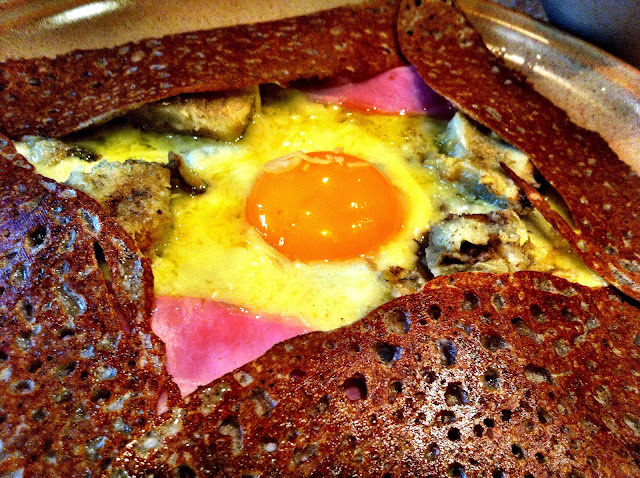 The Croque Madame is the same just with an egg on top. You'll find these are among the cheapest items on any menu. It'll be under 10€ and you won't feel ripped off because it actually is a typical French (light) meal to try. 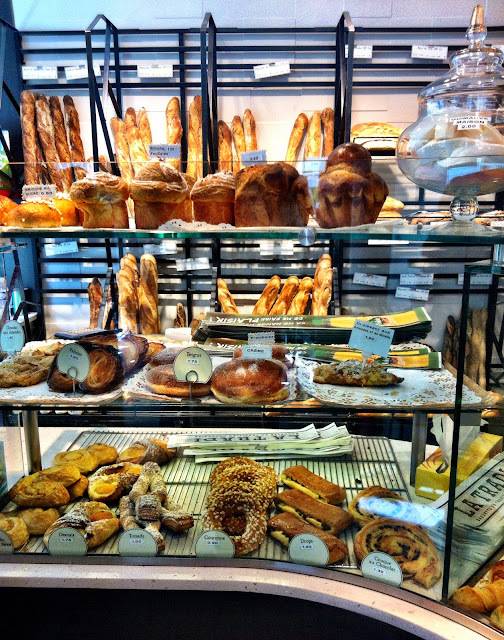 This is how Parisians will have a quick lunch. They'll duck to the local boulangerie and pick up a "sandwich" which is not really what we would refer to as a "sandwich". It's really a baguette with combinations of different fillings like ham, lettuce, tomatoes, egg, tuna, salami, cornichons, but it's called a "sandwich" in France (a "baguette" is just a baguette with nothing inside). Prices range in between ~ 3€ and 5€ and it is gooooood. Prices start at 2.80€ here! 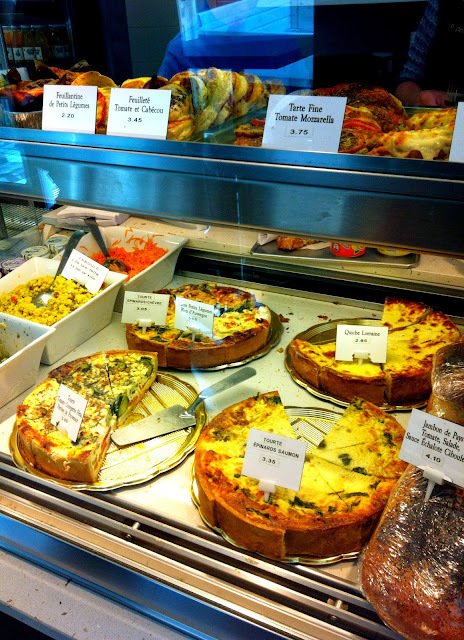 A thick slice of quiche will set you back around 3€ to 4€ which isn't too bad either! 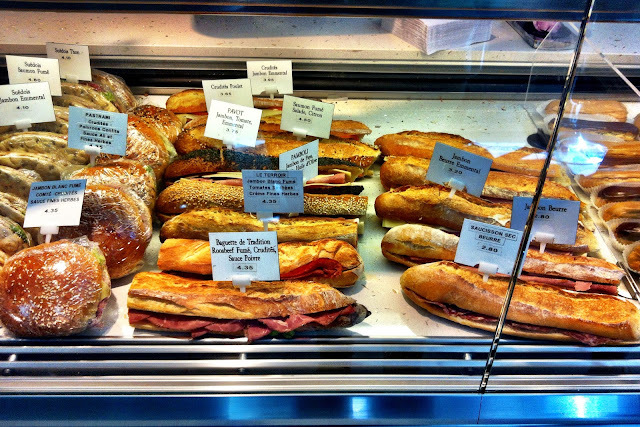 Or, a "panini" which is a toastie-toastie in the size of a long baguette with different fillings. One of my favourites in the Winter months when I need some warming up. Keep an eye out for a "formule", a meal deal for a "sandwich", a drink and a pastry for dessert. 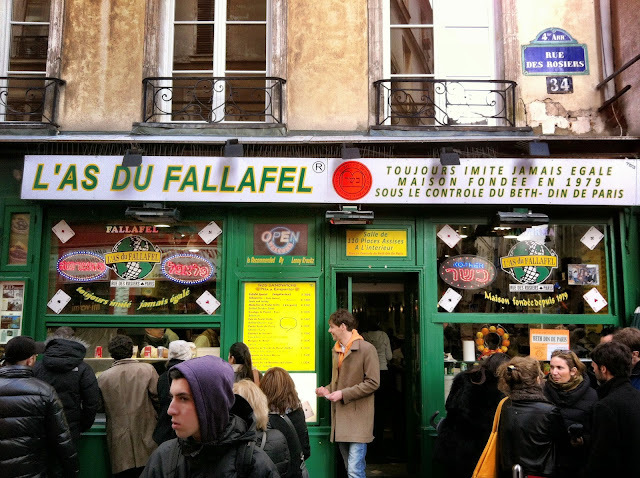 Tucked away in the Jewish area of Paris in the highly popular Marais is L'as du Fallafel, the most famous falafel joint in Paris. Lenny Kravitz once went here and I'm not sure if it was as well known before but ever since then, people having been queuing for the traditional spicy eggplant falafel. At 5.50€, it will fill you up for the whole day. Dine in is more expensive so you'll see people carrying their falafels walking around on the street. My favourite thing to do is to take it to the nearby Place des Vosges park to devour. My friend who lived in Paris took me here for the first time in 2008 and it's still just as good now! So it's not very French. But if you ever get sick of French food on your trip and are craving something a little different that won't cost an arm and a leg, the Asian quartiers are the places to go. Try Belleville or the 13th for Vietnamese (the French love their Bo Bun and Pho), Chinese, Cambodian, Thai. Try around rue Sainte-Anne for Japanese and maybe the odd Korean restaurant in the 2nd. 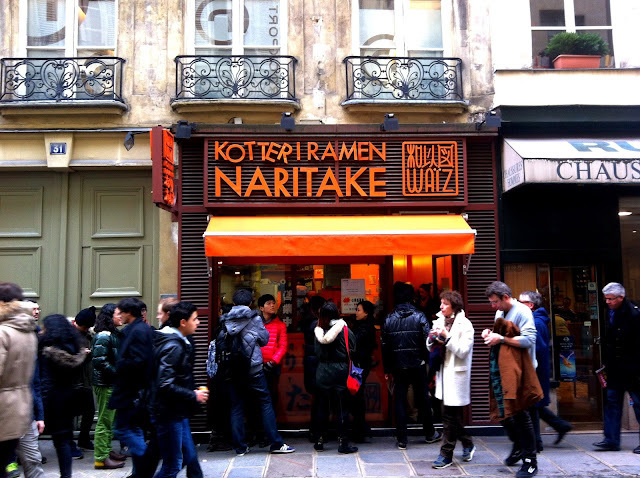 A bowl of hot ramen can be found for under 10€ easy. Some great places to check out are Ten Belles, KB café, Tuckshop, Ob-La-Di, Boot Café, Merci, Café Pinson, Folks and Sparrows, La Caféothèque, just to name a few. Toulouse sausage and roquefort anyone? A touch of home at Ten Belles.. 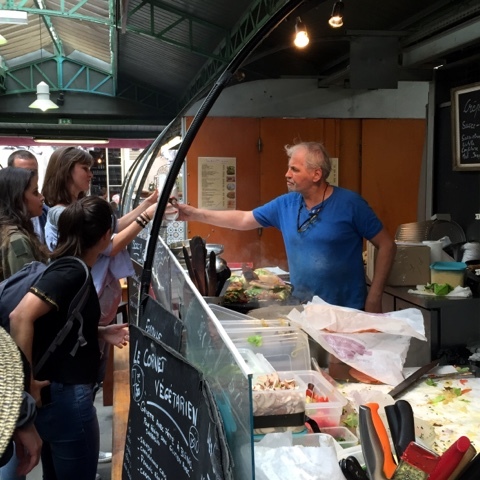 Check out the website of your local "mairie" to find out which days are market days for the arrondissement you are staying in. Or even better, stumble across one when you are walking aimlessly around Paris. Browse the stalls for fresh produce to either bring back to your apartment to cook or pack into a picnic! Too many to choose from! 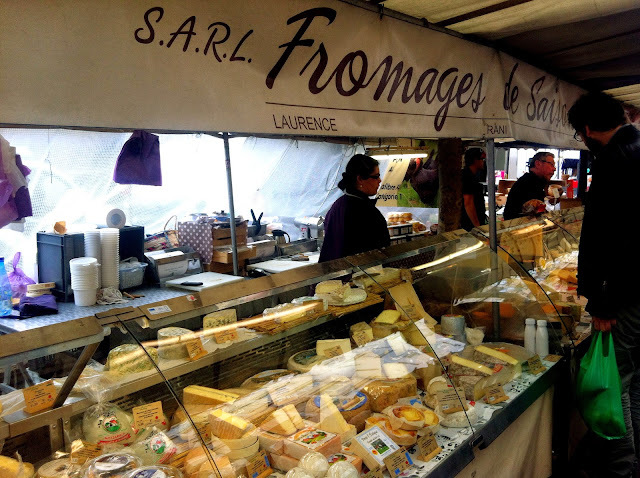 Note that there are always little stalls that sell food from the different regions of France, they aren't as abundant as the fruit and vegetable stalls but keep going until you find one. Decent take away serving sizes can range between 5€ and 10€. Supplement what you find at the market with a few picnic essentials at the supermarket. All you need is a baguette, some camembert, ham, maybe some cornichons (pickles), fruit and a bottle of wine then you're set for a picnic in the park which will definitely work out for under 10€. These may be a little harder to find because they are sometimes not in central Paris. 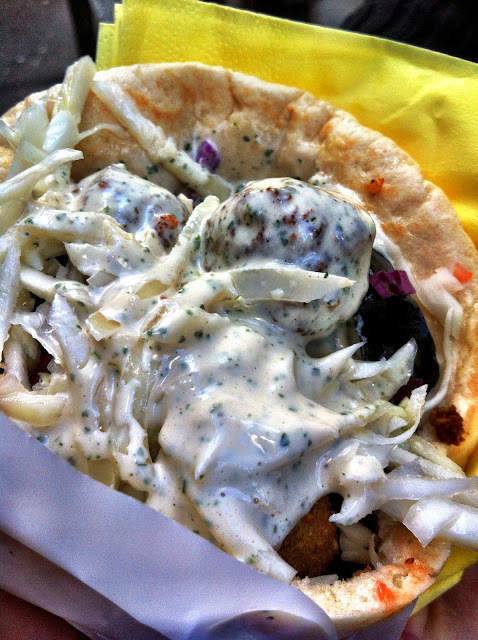 Point Ephémère regularly has a roster of food truck appearances in the 10th. This weekend, there's also a Street Food Festival on which is easier to access. While the festival might have finished by the time you read this post, it still brings up a huge list of participants you can google to find their current schedule when you are in Paris! 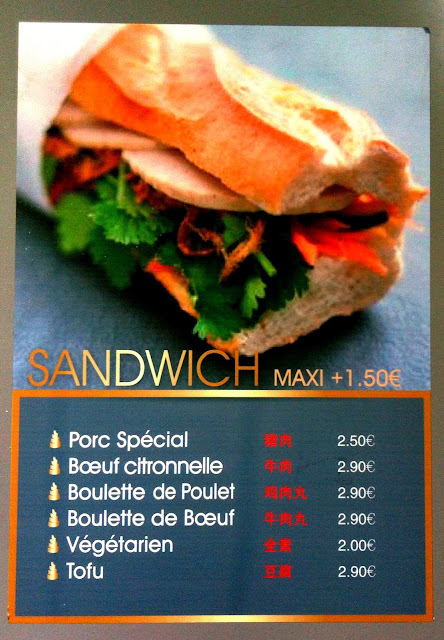 Last but not least, this is by far the cheapest meal you will find in Paris (it's the cheapest I have found anyway). Loads of places in the 13th (there are at least three places on Avenue d'Ivry itself) as well as Belleville etc. Look out for the lines and expect some change as you hand over your 3€, I'm not joking...! Good question Bao-Kim! Croque Monsieurs/Madames are fairly basic to make in terms of ingredients and technique so the ones I have tasted have been on similar levels. Unfortunately, I haven't really eaten ones that have been exceptional however - I have heard of a place where they were invented/accidentally made which I'm trying to track down. Also the one at Le Nemrod Croque Poliane is another one I've heard about but I don't blog about things I haven't personally tasted - if you want we can go check it out together some time..! I'm a 31 year old half Chinese, half Vietnamese, Adelaide-born Australian who, for some reason can't seem to keep still. I have a love for food, languages, writing (in secret until now), travelling and all the little things that crop up in between..! All the photos and text featured on this blog are mine, unless cited otherwise. If you'd like to use something from here, please link it back or feel free to contact me on myloveforparisblog@gmail.com or my Facebook page - My Love for Paris. Paris RATP Metro Pranks Commuters on April Fool's Day..!! Copyright © 2013 - 2014. Nhan Nguyen. My Love for Paris. All rights reserved. Powered by Blogger.